The No. 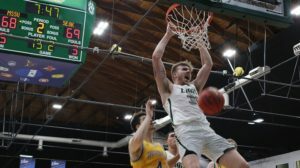 1-ranked Northwest Missouri State men’s basketball moved on to the NCAA Division II Central Region final with a 70-59 triumph over the Southern Nazarene University Crimson Storm in front of a sold out Bearcat Arena. Senior Joey Witthus led all scorers with 29 points as he made 10-of-16 shots from the field, including a trio of three-pointers. Northwest (34-0 overall) will take on MIAA foe Missouri Southern on Tuesday at 7 p.m.with the winner advancing to the NCAA Elite Eight in Evansville on March 27-30. The Lions (25-7) advanced to the regional finals by defeating Southeastern Oklahoma State today 92-83 inside Bearcat Arena in Maryville, MO. Cam Martin led the scoring attack for Southern as he finished with 34 points and 18 rebounds for his 20thdouble-double of the season. Martin now has 700 points this season and joins Taevaunn Prince as the only two Missouri Southern players to score 700 or more points in a single-season. Earlier this season, Northwest and Missouri Southern met in Bearcat Arena with the Bearcats scoring an 82-62 win on Feb. 2.